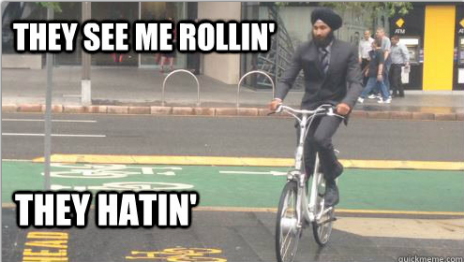 The Queensland announcement was the result of a campaign set in motion by Jasdeep Atwal, a member of the Sikh community in Queensland who appealed a fine issued to him when he did not wear a helmet whilst riding his bicycle due to his turban, an important article of the Sikh faith. On 23 April 2013 the Legal Advocacy Team wrote to the Honourable Gladys Berejiklian, MP, the New South Wales Minister for Transport seeking an amendment to bicycle helmet laws. Specifically, we urged the Transport Minister to bring New South Wales’ helmet laws in line with other Australian States and Territories that had established an exemption for helmet use on the grounds of religion, noting such exemptions have been in place for over 20 years. Last month the Legal Advocacy Team, accompanied by members of the SYA executive, were invited to meet with various policy and road safety representatives from the Transport for NSW, the agency of the New South Wales Government that formulates and implements transport policy. The brief was very well recieved and there was a robust discussion regarding the various issues raised. Whilst recognising the growing profile of the SIkh community in Australia and the importance of the turban in Sikhi, the foremost concern of Transport for NSW's representatives centred around implementation models of the exemption and the health and safety issues associated with such a change. We have since been in contact with policy officials for Transport for NSW and working toward a tentative timeline of 6 months for legislative amendment. You are able to download our submission to Transport for NSW here. We look forward to keeping the community updated on our progress in this matter. If any members of the community in the Northern Territory, Tasmania and ACT wish to lobby their respective state governments, please contact us and we will be happy to assist! You can download the submission to Transport for NSW here. I think it is okay to wear a helmet, its only for your own safety. Thanks for that Ryan, we are stocked for all kids to get out and give sufnirg a go, pretty special to see how much happiness it brings to people and their families. Image: CubaGallery The NSW State Government announced on 6 September 2011 that as of 1 January 2012 First Home Buyers picahrsung established properties will no longer receive a stamp duty concession.